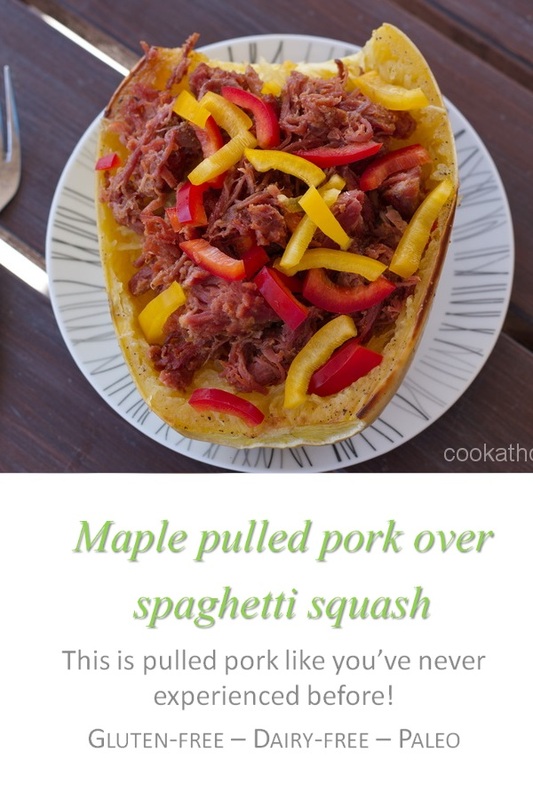 A decadent maple glaze with pulled pork, all in a spaghetti squash – what’s not to love? Some days I love social media. I love being inspired by people who are way more creative than me. And trying out their recipes, and adding a Sarah touch to them. And then sometimes you get to meet these amazing people in person. That’s what happened with me and Leanne from Crumb Top Baking. We had been following each other for a little bit on Instagram when there was the Everything Food Conference held in Salt Lake City. Now I knew I was volunteering at the event so when I saw Leanne post that she was going to be at the conference, we made a time to meet up. And we did. And Leanne is so lovely in person – we were able to discuss a whole range of topics including how social media can be good or not-so-good at times. But that was one of the good times! A few months ago, I wanted to feature some of these amazing recipe creators on my Instagram account, give them a ‘shout-out’, and so I approached Leanne with the idea that we share each others recipes on our stories. And then she came back with the idea that we actually take one of each other’s recipes and make it, photograph it and then use that as a post. So it sticks around, rather than disappear after 24 hours on the Instagram Stories. She made my zucchini dip and made it look so wonderful (see here for her write-up and gorgeous photo!). And then I had the agonizing decision as to what to make from her blog. I was initially drawn to her pumpkin spice macaroons because I love things that are naturally gluten free (check out my mint chocolate macaroons I adapted from another blogger! ), but I was going through a trial of restricting my nut intake to try to heal my gut (another post on that later!). 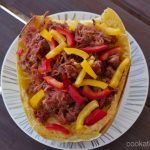 And then I saw this recipe, for maple glazed pulled pork. Over spaghetti squash. Now, could you get any more of my favorite savory foods in one dish? I think not! So I did change it a little bit. I didn’t cook the pork from scratch (shock horror!) – I used some pulled pork we had bought at Costco. But Leanne has some really simple instructions for making this yourself. I also removed the onion and garlic powder as I was going through a low FODMAP eating plan at the time (again to heal my gut and again, more details in another post later!). Leanne also included some shredded cheese to melt over the top, which I know would taste amazing, but with my dairy intolerance, I just skipped it. But let me tell you, even though I had to leave out a number of ingredients, this was just amazing in taste. 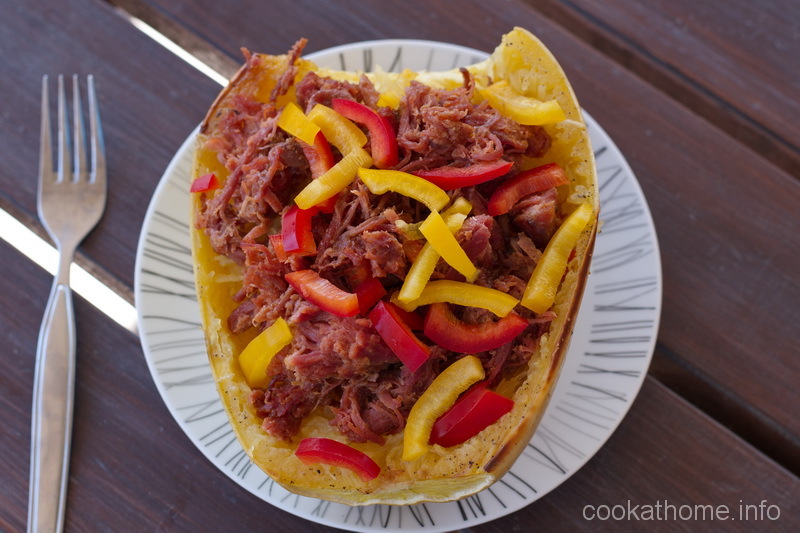 And if you buy the pre-made pulled pork, and use your Instant Pot for cooking the spaghetti squash (google the instructions and you’ll have a cooked squash in 10 minutes tops! ), you can have yourself dinner in maybe 30 minutes. If you want to go the slow and traditional ways of cooking, it will take a little longer, but it’s well worth it! Pre-heat the oven to 400F and line a baking sheet with parchment paper. Cut the ends off the spaghetti squash and cut in half lengthwise. Scoop out the seeds and brush the flesh with oil. Place the squash face down on the baking sheet and roast for 30-40 minutes or until a fork can easily pierce the skin and flesh. While the squash is cooking, in a small dish, combine all ingredients for the glaze and set aside. Heat up a large frying pan, add cooking oil of choice and saute onions until soft. Add the pulled pork and heat through. Add the glaze to the pork and combine well. Once well combined, turn the heat to low and set aside, stirring occasionally until the squash is ready for assembly. Once the squash is cooked, remove from oven and set aside to cool enough to handle. Scrape through the flesh with a fork to create strands, keeping them within the skin. Add the pork and peppers to the spaghetti squash 'noodles' and return to the oven for an additional 15 minutes or until all ingredients are heated through. Add cheese if you desire (and do not have any dairy issues). Store any leftovers in an airtight container in the fridge. Leftovers keep for 2-3 days.